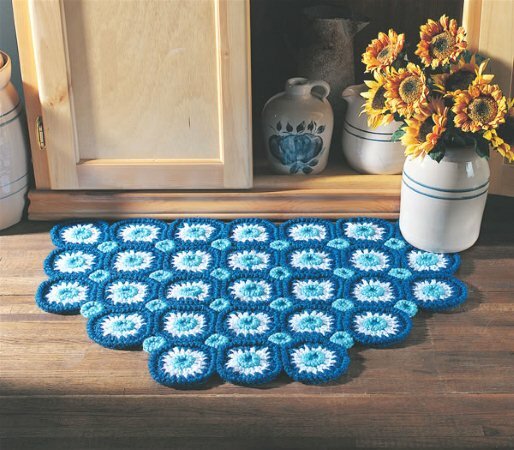 Country charm and comfort combine in this refreshing addition for kitchen or bath. Perky blue and white motifs will cushion your toes and soothe your senses with relaxing springtime appeal. I crochet hook or size needed to obtain gauge. Rnds 1-3 of Large Motif = 3" across. Each Small Motif is 1 1/4" across. Rnd 1: With lt. blue, ch 4, 9 dc in 4th ch from hook, join with sl st in top of ch-3 (10 dc). Front of row 1 is right side of work. Rnd 2: Working this rnd in front lps only, ch 1, working from left to right, reverse sc in each st around, join, turn, fasten off. Rnd 3: With wrong side facing you, working in remaining lps of rnd 1, join white with sl st in first st, ch 4, dc in same st, ch 1, *(dc, ch 1, dc) in next st, ch 1; repeat from * around, join with sl st in 3rd ch of ch-4, turn, fasten off (20 dc, 20 ch sps). Rnd 4: With right side facing you, join dk. blue with sl st in any ch sp, ch 3, dc in same sp, 2 dc in each ch sp around, join with sl st in top of ch-3 (40 dc). Rnd 5: Repeat rnd 2. Rnds 1-2: Repeat same rnds of Large Motif. With wrong side facing, working in remaining lps of rnd 4, with dk. blue, sew 7 dc on each side of Motifs together according to Assembly Diagram leaving 3 sts at each corner between 7-dc groups unsewn. Easing to fit, sew Small Motifs to spaces between Large Motifs according to diagram.